Todd Grantham's defense finished 45th in the nation in total defense (375.5 yards per game) and were 78th in points allowed (29.0). Todd Grantham is no longer at the helm of Georgia’s defense, leaving after four years to take the same position at Louisville. 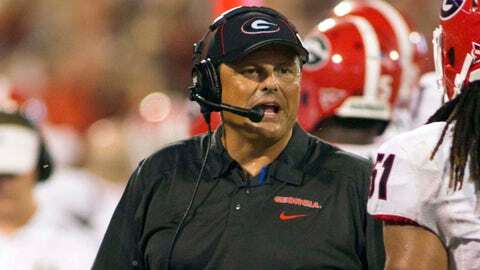 Bulldogs coach Mark Richt announced the move Sunday evening. There had been speculation that Grantham would be fired after a season in which the Bulldogs finished 45th in the nation in total defense (375.5 yards per game) and were 78th in points allowed (29.0). But in a Dec. 2 interview, coach Mark Richt told the ‘Ledger-Enquirer’ (Columbus, Ga.) that the defensive coordinator’s job was save. "We are appreciative of all the contributions Todd has made to our program and wish him nothing but the best," Richt said during Sunday’s announcement. "But at the same time the opportunity to work at Georgia is extremely attractive and there already is, and will be, interest from some very, very outstanding coaches. "We have a lot of defensive players coming back, as well as some outstanding defensive recruits, and there’s going to be plenty of interest in coaching them. I’m excited about the prospects of a great defensive coordinator being on board as quickly as possible." Grantham, who has an NFL pedigree with stints with the Colts, Texans, Browns and Cowboys, installed a 3-4 defense in Athens that looked to be taking hold. The Bulldogs ranked 23rd in his first season of 2010, then shot up to fifth in ’11, but faded to 32nd last season with a star-studded cast and then dropped even further in 2013. He moves over to new Cardinals coach Bobby Petrino’s staff with big shoes to fill. Former coach Charlie Strong’s defense led the nation last season in total D (251.5 ypg). Per CBSSports.com’s Bruce Feldman, the Bulldogs have contacted Houston’s David Gibbs as a potential replacement for Grantham. Gibbs’ Cougars led the nation in turnover margin, forcing 1.9 per game.